Pros: The show has good ensemble work, comedy and storytelling in a cozy setting that incorporates audience interaction. Cons: Visibility was poor at times, and the staging of certain scenes was distracting. A fun, light-hearted take on dark stories that is dependent on the audience interaction; a well-balanced production. This being my first time at The Space, I was quite charmed by the atmosphere of this converted church that incorporates an auditorium, box office and a bar. 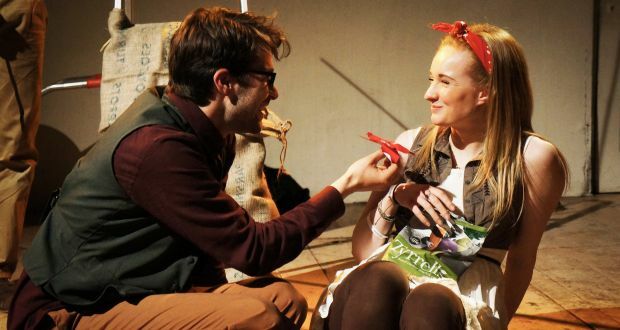 Located in the Isle of Dogs in East London, The Space is a warm, welcoming and pleasant place to take in such an intimate piece of storytelling as Wilde Tales. Wilde Tales is an adaptation of several Oscar Wilde short stories, adapted and directed by Sepy Baghaei of Suitcase Civilians. Taking from Wilde’s The Happy Prince and Other Stories and A House of Pomegranates, the audience is introduced to a ‘merry band of travellers’ who have stopped in the forest to entertain the audience with these tales. Stories of good and bad, love gained and love lost, light and dark, make for an enjoyable 60 minutes of theatrical entertainment suitable for any age. The small ensemble of four actors take on various roles throughout the stories: a princess wanting to be pleased for her birthday, a giant ruling over his garden, and even the statue of a king befriending a little swallow. Despite the dark nature of these stories, the cast seems to always find joy in the telling of them. Our ‘merry band’, led with strong guidance by Jade Allen, with Ashley Pekri, Harriet Attwood and Heath Ivey-Law as the players, brings a real sense of playfulness to the stage. The work they’ve done together as an ensemble is evident from their keen ability to listen to and improvise off one another, as well as the audience. The rapport between the actors and the audience is essential to the comedic timing, and works to their advantage. The production follows the mission of Baghaei’s company Suitcase Civilians, which sets out to create ‘easily transportable’ works. All props are made from everyday objects, such as flowers made out of tissue and a bird puppet made from newspaper. It makes the show feel accessible to any audience member and any type of space. Sepy Baghaei’s adaptation works well within the format of a travelling show. Her solid direction gives her actors the tools and opportunities to enjoy themselves as much as the audience. I-Shun Lee’s lighting design helps to clearly signal the start and end of each story. As it began, it took me a moment to grasp the set up of these travelling performers preparing for a show, which I wished would have been made more distinctively clear from the start. The traverse, or runway style, staging works well for interacting with the audience, but blocked my view in certain scenes. Due to the nature of the show, with many short stories rather than one long one, there’s a sense of breaking character in between each story, and at times, during scenes for comedic effect. I found the latter bothersome occasionally, as it made it hard to believe in the puppets as characters. 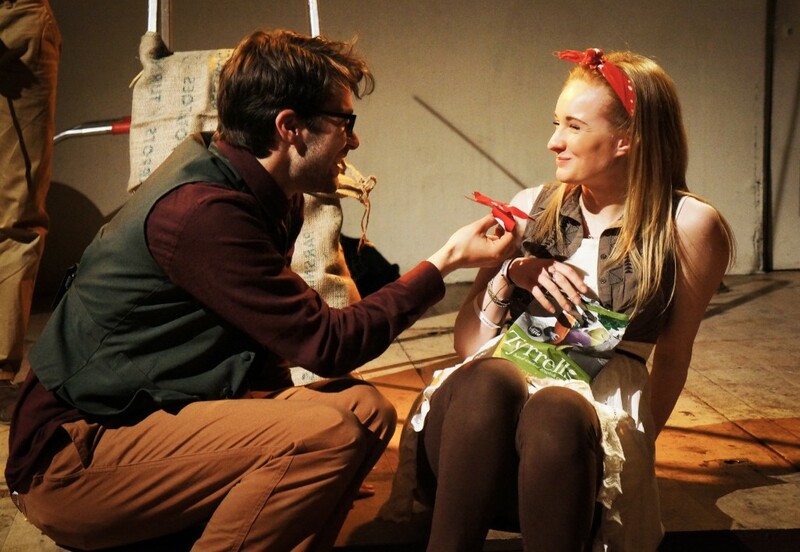 The bird puppets were brilliantly crafted out of newspaper and a glove, and characterised convincingly by Jade Allen. Each step back into her role as a player, however, broke the illusion for me. Although it was done for comedic effect, the more it occurred, the less it convinced me suspend my belief. All in all, Wilde Tales is a fun evening of entertainment and storytelling, for the young and the old alike. The cozy atmosphere of The Space lends itself to the travelling nature of the show. Despite the blocked views and somewhat distracting staging, this passionate ensemble is clearly dedicated to telling these stories, showing a good, balanced performance of both the light and dark sides of life. An American theatre artist living in London, Olivia received her BFA in Acting from Arcadia University in Philadelphia, and has received her MA in Applied Theatre from the Royal Central School and Drama just last year. She has performed across Pittsburgh, Philadelphia and London. She is co-founder of her company Art Lingual, which provides workshops for international students and refugees developing English language skills through drama. She’s wanted to write theatre reviews for a while, but did not have the platform to do so until now. Her theatre tastes include new works, the classics and musicals. She loves Italian food, exploring new places and polka dancing.